I read this article and found it very interesting, thought it might be something for you. The article is called Leghorn Chickens and is located at https://www.chickencoopguides.com/breeds/leghorn-chickens/. When asked to bring to mind a chicken, many people instinctively visualize Leghorn chickens. With their downy white or deep mahogany feathers and distinctive oversized red combs, they hold their own as a barnyard standard. While skittish in nature, Leghorns are reliable egg layers, skilled, able-bodied grazers and a solid addition to any farmyard, from recreational backyard raising to larger scale operations. Leghorns are ideal for those whose focus is on raising a reliable source of eggs. On average, they lay around 280 large, white eggs a year, with some particularly productive hens producing up to 320, while consuming less feed than many other breeds. Hens are also markedly non-broody, meaning they will spend more time laying and foraging for food and less time attempting to sit and hatch their eggs. However, there are a few factors to take into consideration before choosing this particular breed. 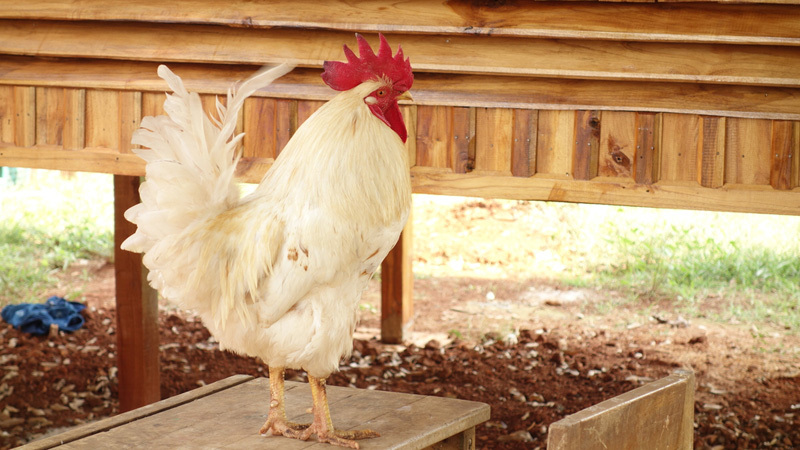 Leghorn chickens are a nervous bunch that don’t always take well to human companionship. They are not ideal for those with small children or for those who would like to raise their chickens as pets as well as producers. Because of their visually striking coloring, white Leghorns may also be more vulnerable to predator attack. While they are excellent egg producers, their small bodies make them less ideal for meat production, though red Leghorn chickens to tend to grow larger in size than their lighter colored counterparts while still maintaining high rates of egg generation. Pre-sexed chicks can typically be purchased for around $3 a bird and can often be obtained pre-vaccinated. Sexing chicks can be a difficult process, especially for novice owners, so it may be wise to have this done in advance. If you are within city limits, it is important to first research regulations surrounding rooster ownership, as many cities restrict chicken ownership to hens only due to noise concerns. Day-old Leghorn chicks are commonly found in farm supply stores and other local sources, though it is becoming increasingly popular to purchase chicks from reliable online markets. Newly hatched red and white Leghorn chickens can be safely and conveniently shipped to your address with minimal discomfort for the chicks. Leghorns are a hardy breed that withstands the stress of transportation particularly well. Once you take ownership of your chicks, the first six weeks of their life should be spent primarily in a brooder box. Here, the temperature can be kept at approximately 95 degrees with a high-quality heat lamp. This approximates the temperature that would be provided by a brooding mother hen. Ample access to food and water should be provided at all times, with a soft layer of pine shavings as the ideal bedding. Though cedar is also frequently used, the essential oils in the wood have been known to cause respiratory problems in vulnerable young chicks. Newspaper shavings are also occasionally recommended, but lack the comfort of true wood shavings, increasing stress behaviors such as pecking. Once they have shed their downy fuzz and grown their first layer of adolescent feathers, your white and red Leghorn chickens are ready to transition into a coop. All varieties of Leghorns tend to prefer a roost height of four to eight feet. They are also highly effective grazers. Coops that provide ample access to the outdoors with high roosting and nesting areas available are often ideal for this flock. They are also highly intelligent birds that may take advantage of any means of escape. You may want to take this in consideration by ensuring your coop has the ability to be well-secured when needed. Chickens can be a great and productive part of a sustainable homestead or farm. If well provided for, your rugged flock of Leghorn chickens will provide an ample supply of large, white eggs, living a long, healthy life.